Skywind, the fan-made project aiming to give Morrowind a new lease of life within the Skyrim engine, has a new trailer. The video, which you can watch towards the bottom of this article, shows off the hidden ruins of Morrowind’s forgotten Sixth House, Dagoth. In Morrowind lore, House Dagoth was thought to be dead, its leader, Dagoth Ur, defeated by Nerevar and the Tribunal Temple. 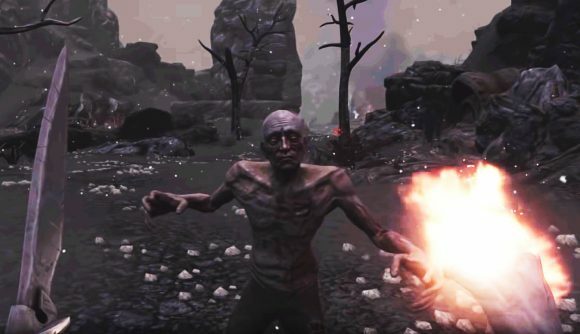 Dagoth and his blood brothers had, however, fled to the ruins of their home within the Red Mountain, and spent 3,000 years hiding and growing stronger before returning to Morrowind during the events of The Elder Scrolls III. The new trailer (via DSOGaming) is a story teaser, documenting the fall (and eventual return) of House Dagoth, and attempting to capture the sinister presence the house was famous for. Narrated by Dagoth Endus, it shows off the ruins of the house, but then heads into the lava-filled hideouts beneath the Red Mountain. There’s also closer look at the Dwemer Ruins that Dagoth Ur originally pledged to protect. Footage and screenshots of Skywind have been doing the rounds for a while now, but for my money, this is the closest to Skyrim the mod has ever looked. That’s in part down to TESV’s very recognisable combat, but weaving through those underground hideouts is also reminiscent of the latest game in the series. Sadly, there’s still no news on a release date for Skywind, but it seems that work on the mod is continuing at a reasonable pace. If you want into the mod when it eventually becomes available to the public, you will need to own both Skyrim and Morrowind, but at this point, that shouldn’t set you back all that much.